Katie: "I started working with Fudge Professional five years ago. The hair is so important for Katie Eary shows, because my designs are very print-tastic, and when it comes to my shows they’re always drenched in colour and vibrancy. The week before a show I’ll sit down with Fudge Professional, tell them about my inspiration for the collection, pulling together my references and what I love, to show the team. From here, we work together to create the hair look for the show. Talk us through what the priorities are when it comes to show day. Katie: "When it comes to show day, every designer has to look their best. You find that you’ve been toiling away by yourself for six months in the dark, so I’m always ready for a bright colour for the show and happy to let Tracy do what she wants. I’ve had orange, yellow, red, pink and rainbow hair with different balayage techniques. Anything with Fudge Professional Paintbox colours is always great! Fudge have been so supportive of my shows. Designer collaborations are often watered down, but I wanted to make sure ours wasn’t. I took a print straight from the runway and incorporated this into the apron and cape, so they look like they’ve come straight off the catwalk as ready-to-wear". 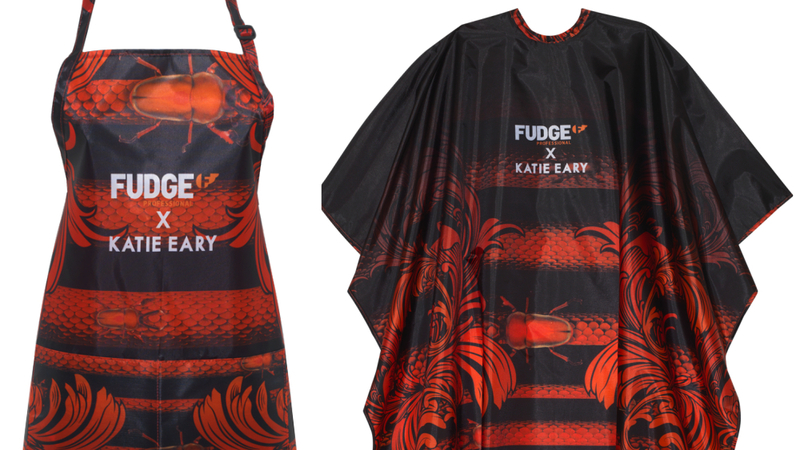 Fudge have worked on the hair for Katie Eary’s shows for a number of seasons now. What has been your favourite look of all and why? Tracy: Working with Katie is always an exciting collaboration as she loves colour to be a big part - including the hair. This enables us to push the creative boundaries of the Fudge Professional colour range. Although it is difficult to choose a favourite from the many shows we have worked on together, I would have to say SS18 really showcased our Paintbox range at its best. I coloured many wefts in lime greens, salmon pinks and burnt orange, which the hair team then weaved into the models’ hair, resulting in such a powerful visual for the catwalk. How different is the preparation for a fashion show when you’re creating colourful looks in the models’ hair, versus when the look is more natural? Tracy: The hair tests for the shows can often be finalised at the last minute, or even change drastically a few days before. So you need to be prepared, ensure that you have plenty of colour stock in all colours, and plenty of wefts, and be prepared for long days! Always do test colours to show the designer, as a colour in the pot can sometimes look different on a weft. What would your advice be for young colourists looking to get more involved in working with designers and at Fashion Week? Tracy: Positive attitude and lots of energy! Put yourself forward for opportunities wherever you can and try work with hair teams backstage to learn and build relationships.